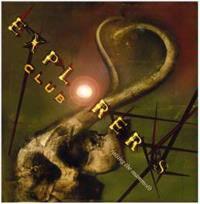 Explorer's Club is in session once again. 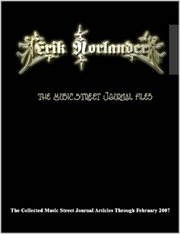 This time Trent Gardner has assembled a different group of musicians that includes drummer Terry Bozzio (UK, Frank Zappa, Bozzio Levin Stevens), bassist John Myung (Liquid Tension Experiment, Platypus, Dream Theater), Kerry Livgren (guitarist for Kansas), Gary Wehrkamp (Shadow Gallery) and keyboardist Mark Robertson (Cairo). Marty Friedman (best known for his work as guitarist in Megadeth) also makes his presence known. Gardner adds vocal, keyboard songwriting talents to the project. The vocalists this time around are Steve Walsh (Kansas) and James LaBrie (Dream Theater, Mullmuzzler). If Age of Impact prompted me to compare it to Yes' Close to the Edge, then this release would be Explorer's Club's Tales From Topographic Oceans. Much like that Tales…, this one is a meandering sort of work that although it contains some awesome passages, doesn't work so well as an overall piece. Although the album is divided into four sections, much like Topographic, Gardner considers it to be one piece, as Yes vocalist Jon Anderson envisioned their release. Among the things that work really well on the album are the vocals, most notably Walsh 's. The segments on which he sings have a great Kansasish texture and are among the best of the disc. Some of the more coherent musical passages are quite impressive as well -- especially those that call to mind Emerson, Lake & Palmer. The album just doesn't work that well overall, and feels a bit lost at times. At least I felt a bit lost at times listening. Neo-classical textures begin this and build for a time. Then an odd vocal line takes the piece for a time. An instrumental progression takes over, then a new hard-edged segment takes the cut. When Steve Walsh's vocals enter, they bring in a Kansasish texture with them. This runs through, getting quite hard edged and powerful at times. It also wanders a bit continuing through various prog changes. It becomes a bit ELPish at times, mostly due to Mark Robertson's keyboards. More prog changes ensue, running a bit hard to follow at times. The ending instrumental build up is especially strong, though. It crescendos and dissolves into ambient textures that move into Part 2. Rising out of the sounds left by the previous segment, this one evolves into a balladic sort of mode. The vocal segment that eventually emerges is quite strong. The cut travels along a growing path with some powerful moments, weaving its story about the sad state of our materialistic, commercial society and the chance that we have to escape it. This is the strongest segment of the disc, and really works. The lyrics to this movement are based on a cool word play - "let's be vertebrates" - in other words, lets have a backbone and try honesty. Musically it comes up from the silence left behind by the previous segment with neo-classically-tinged strings. As the rhythmic structure enters, it feels a bit like ELO for a time, then a more solidly balladic texture takes the cut, and Trent Gardner and James LaBrie exchange vocal lines. It stays quite mellow throughout the majority of the piece, building very slowly. At times the vocals feel a bit like Chris Squire. Appropriately the arrangement actually feels a bit like something he would have come up with. It jumps to a harder edged jam later, with a cool texture. That instrumental segment represents both a solid jam and a strong conclusion to the movement. The keys in particular here weave an intricate story. It gets rather hard edged at times, and dissolves into chorus to end. Dramatic, slightly mysterious tones begin this instrumental, then a somewhat funky bass line/percussive track takes the piece, and the guitar wanders over the top in rather Zappaish lines. The cut evolves into a different jam after a time, very percussion oriented. It then shifts to a more melodic and triumphant sounding jam - a bit ELPish. It shift directions again to a more off-kilter segment, then drops back to the previous section, building forward on that progression. It gets quite intense and frantic before resolving to a new section, this one becoming rather dramatic and metallic. An outro type of section takes the cut to a false ending. Then sounds of an orchestra tuning up take the piece. It begins building from there in neo-classical waves. Then the drama starts escalating as keyboard textures continue to wash over. A bass line that calls to mind the intro to Genesis' "Watcher of The Skies" gains dominance for a very short time before a triumphant crescendo merges and the cut builds on that theme for a time. Another crescendo gives way to a pretty piano line, and the piece begins building on that mode in a balladic style. It becomes quite pretty before shifting to a harder edged segment building on those themes. It explodes to another very ELPish zone. An organ solo beginning with melodies based on wedding music takes it after a time. The cut evolves into a very different jam, then another very early Genesis oriented process begins. This progression continues and these sound alternates between Genesis and ELP. The ELP textures become the dominant ones after a time, taking the cut to its next jamming segment. Then another, more melodic progression takes over and moves the piece to its ending movement, a sedate melody line.